A quick and easy guide to greasable bearings. A bearing is a housing or support for a rotating part or one that moves linearly. 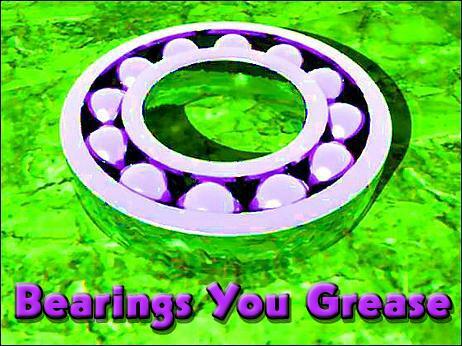 Bearings are of two basic types: plain and rolling-element. Plain bearings are based on sliding motion between a stationary and a moving member, and are almost universally used in engines. Rolling-element bearings have either balls or rollers that accommodate motion between the stationary and moving parts. In either case, a film of lubricant separating moving surfaces is essential for long service life. Plain bearings that support loads perpendicular to their axis of rotation are called journal bearings; rolling-element bearings carrying similar loads are called radial bearings. Bearings of either type that support loads parallel to their axis of rotation are called thrust bearings. Bearings may be self-lubricated or externally lubricated with oil or grease. Grease is generally preferred under high loads or when good adhesion to bearing surfaces or good sealing properties are necessary. A plain bearing is the most basic type and contains no moving parts. In most cases, a plain bearing is made of a material or alloy that is softer than the part that slides or moves against it. Consequently, the bearing assumes most of the wear. This is an important economic advantage because bearings are more conveniently replaced or adjusted than the relatively inaccessible moving components. The major categories of plain bearings are journal, guide and thrust bearings. A journal or sleeve bearing consists of a cylindrical housing supporting a rotating shaft. The term "journal" refers to the portion of a shaft contained within a bearing; "sleeve" refers to the bearing configuration. If the bearing is a full-cylindrical, 360-degree design, it is called a bushing. A shaft that is loaded in a single direction can be supported by a journal bearing in the form of a partial cylinder. Such a bearing supports the shaft in the load zone only. For example, cranes, earth-moving equipment and railroad journals use partial-cylinder bearings to support loads directed against the top portion of an axle. Journal bearings frequently contain two or more parts to facilitate removal or replacement. Automotive engine main bearings, for instance, contain two half-round sleeves which hold the crankshaft journals. Guide bearings support reciprocating (back and forth motion) rather than rotating machine parts; loading is generally less than in a journal bearing. Interior surfaces may be grooved to help distribute lubricant and relieve pressure. Equipment using guide bearings include crossheads in steam engines and some air compressors. Thrust bearings accommodate the axial movement of a rotating shaft. They are usually used in conjunction with journal bearings and are lubricated by grease, which leaks from the ends of the journal housings. The mode of lubrication of a plain bearing depends on the conditions that affect the bearing's ability to develop a load-carrying fluid film to separate the journal and bearing surfaces. If such a film is not produced (or before it is produced), the lubrication mode is termed boundary or mixed-film - lubrication where the surfaces are not completely separated and some metal-to-metal contact occurs. If a lubricating film is formed with sufficient pressure to separate the journal and bearing surfaces, the lubrication mode is termed hydrodynamic or full fluid-film lubrication. When the shaft is at rest or at low speeds (typically at start up) or under high loads, asperities on the surface of the bearing and journal are in contact. Lubrication under these conditions depends on the nature of the contacting surfaces, lubricant decomposition products that may be present, or surface-active additives which form a thin, soft film on the metal surfaces and prevent metal-junction adhesion to reduce friction. Because of the generation of relatively high levels of friction and heat, and the resulting high rate of surface wear, boundary lubrication is not the most desirable mode of operation. However, at times, it is completely unavoidable. As the journal starts to rotate, it climbs the bearing surface in a direction opposite to rotation. A layer of grease (oil in an engine) clings to the journal and rotates with it. This layer is carried into the converging space between the journal and the bearing and begins to form a thin fluid film. The journal rotates with the film until sufficient fluid has been carried into the converging space to separate the surfaces further. A grease layer clings to the journal and rotates with it; another layer adheres to the bearing surface and remains stationary. Layers of grease within the film slide between the outside layers; those closest to the journal move most while those layers closest to the bearing move least. As speed increases, the wedging action of the lubricant moves in the direction of rotation, and pressure within the film becomes greater so the journal is now riding on a full fluid-film and hydrodynamic lubrication is reached. If loading on the bearings is increased sufficiently, the hydrodynamic film may collapse and the bearing will revert to the boundary-lubrication mode. Grease should be introduced to the bearing where fluid pressure is least - at the point of maximum clearance within the bearing. Grooves are often incorporated in the interior surface of a journal bearing to relieve pressure and to store reserve lubricant. When loading is in one direction, axial grooves running lengthwise on the bearing surface and located in areas of low pressure will not disturb the lubricating film and can relieve pressure. When the direction of loading is variable, the location of pressure extremes within the bearing is also variable. Under these conditions, well-spaced annular or circumferential grooves will relieve pressure without substantially interrupting lubricating films. Axial grooves should be bevelled so lubricating grease is more easily swept from the groove by the rotating shaft. Choice of lubricant: The choice between oil or grease lubrication depends on the relationship of journal speed to viscosity. Slower journal speeds have higher viscosity requirements while high speeds call for a light-bodied oil. Bearings designed for low speed operation usually have a relatively large clearance between shaft and housing, while high-speed bearings usually have a much smaller clearance. A rolling-element bearing has balls or rollers situated between a stationary housing and a moving journal. Rollers can be cylindrical, spherical or tapered. Roller bearings with relatively long, small-diameter rollers are called "needle bearings." Rolling-element bearings are frequently called "antifriction" bearings although the frictional torque of a full fluid-film plain bearing can be as low as that of a rolling-element bearing. However, starting friction in a plain bearing is usually higher than that of a rolling-element bearing. The rolling elements are usually enclosed between rings called "races"; typically, the outer race is stationary and the inner race is affixed to a rotating shaft. Unlike plain bearings, rolling-element bearings are made of hard steel alloys because the small rolling elements must carry a wide range of loadings and unit stresses at the contact surfaces can be very high. Most rolling-element bearings are grease lubricated. Ball bearings are, perhaps, the most familiar type of rolling-element bearing. Radial ball bearings contain the rotating motion of a shaft and are functionally similar to plain journal bearings. Ball thrust bearings are the functional equivalent of plain thrust bearings. A ball-bearing assembly includes balls, a retainer, races, the rotating shaft and the supporting housing. The balls are made of hardened steel, ground to a true sphere, and polished to a fine finish. The balls are held in position by a retainer, or spacers, and roll between races which must also be ground and polished to a fine finish. Bearing housings differ in design depending on the application and serve to support the bearing and contain the lubricant. Suitable seals are usually provided to exclude water, dust, dirt or other external contaminants from the bearing components and to prevent leakage of the lubricant from the housing. A roller-bearing assembly consists of rollers, a retainer, races, a shaft and a bearing housing and seals. As with ball bearings, the contact surfaces of roller bearings must have a fine surface finish that perform with maximum efficiency. (a) Cylindrical roller bearings: The most basic type of roller bearing contains cylindrical rollers placed between the bearing races. The rollers are not true cylinders but are usually crowned or end relieved to reduce stress concentrations at the ends of the roller-race contact. Cylindrical roller bearings can carry heavy radial loads and operate at high speeds. (b) Tapered roller bearings: Because of its tapered roller/race geometry, a tapered roller bearing can carry both heavy radial and thrust loads. This versatile bearing is especially popular in the automotive industry. (c) Spherical roller bearings: This type uses convex or barrel-shaped rollers which accommodate high radial and shock loads and provides for a high degree of self-alignment. However, they are somewhat speed limited. (d) Needle bearings: Needle bearings, containing cylindrical rollers with a high length-to-diameter ratio, provide the highest load capacity for a given radial space of any rolling-element bearing. This type frequently has no inner race and can accommodate oscillating motion. Needle bearings without a retainer, or cage, and a full-complement of rollers provide high load capacity, but are speed limited. Needle bearings with a retainer contain fewer rollers and, therefore, have a lower load capacity, but can operate at higher speeds. To reduce rolling and sliding friction. To protect the highly finished surfaces of the rolling elements and races against corrosion and pitting. This is extremely critical to service life. To act as a sealant. Sources of friction: Rolling action is the predominant source of friction in a rolling-element bearing. Rolling friction arises from metal deformation when a ball or roller under load moves along the surface of a race. A buildup of deformed material preceding the rolling element offers resistance to motion which, in turn, creates frictional heat. Other less prominent sources of frictional heat in rolling-element bearing include sliding, slippage, and abrasive action. A limited amount of sliding friction results when the spacers between rolling elements contact the raceway. Friction also arises from slippage of rolling elements. This occurs in the unloaded region of a bearing where clearance between rolling elements and raceway is at maximum. Slippage also increases with decreasing speed because the reduction of centrifugal force on the rolling elements results in greater clearance. Friction can also result from rusting or corrosion of metal surfaces which produces abrasive oxide particles. EHD films: The principles governing the lubrication of rolling-element bearings differ from those of plain bearings. In a full fluid-film plain bearing, the journal load is supported by a continuous hydrodynamic lubricant film which keeps the two contact surfaces separated. In a rolling-element bearing, unit pressures are extremely high between the relatively small rolling elements and their raceways. Lubricants subjected to the high pressure within the contact zone of a rolling-element bearing undergo a dramatic increase in viscosity. This enables the lubricant film to withstand the high contact stresses while preventing contact between the rolling surfaces. Pressures of this magnitude do not exist in a full fluid-film plain bearing and lubricant viscosity is unaffected. The high contact pressures in a rolling-element bearing also elastically deform the rolling surfaces to enlarge the contact area which supports the load. The combination of surface deformation and hydrodynamic lubricating action produces a thin, elastohydrodynamic (EHD) lubricant film which provides for lubrication within the contact zone of rolling-element bearings. Grease lubrication: Greases provide a lubricating film on the surfaces of rolling elements, separators, and raceways. The lubricant is actually a thin film of oil which is released as the three-dimensional fibrous network within the grease is ruptured under shear. Only that portion of the grease in intimate contact with moving surfaces breaks down; the balance remains intact and functions as a sealant. When a freshly charged bearing begins to rotate, grease is thrown from the rolling elements and is rapidly circulated through the housing. After a short time, grease from the rotating outer race is then thrown back onto the rolling elements where shearing takes place. This turbulent environment at the outset of rotation creates frictional heat which attains a maximum and then gradually diminishes as the continual shearing action releases a lubricating oil film. As lubrication takes effect, the temperature of a properly charged bearing will drop and assume equilibrium.